Tankit is a one component polymer rich cementitious material which is mixed with clean potable water on site and used in conjunction with fibreglass reinforcing material to create a unique high build, low shrinkage membrane. 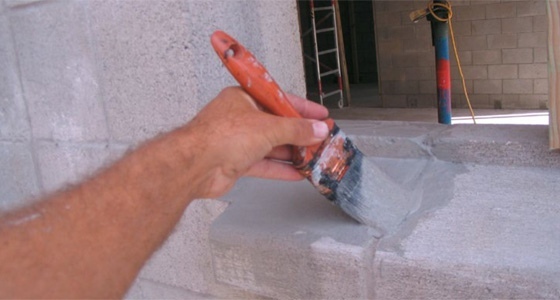 Tankit can be easily applied over a variety of properly prepared concrete and masonry backgrounds to produce a waterproof backing prior to the application of Specialized’s wall claddings. When the Tankit is mixed with water is creates a chemical cure which permits the product to be applied in poor curing conditions. Tankit will exceed the 15 year minimum durability requirements of the New Zealand Building Code Clause B2 providing it has been used in strict accordance with Specialized’s written instructions, is used within the design parameters of its specification and is used in conjunction with other approved and correctly installed building systems and materials. Tankit must be applied in 2 coats and must have a minimum dry thickness of 800µm. Where the product is being used to bridge the gap between different substrates or there is any concern with regard to the potential for ongoing movement in the substrate, Tankit must be reinforced with alkaline resitant fibreglass mesh weighing no less than 150g/m2 between the first and second layers. All nibs, protrusions and excess mortar or irregularities in the slab must be ground off prior to plastering. All surfaces to receive an application of Tankit must be clean and free of debris, dirt and dust, efflorescence, grease, oils, curing agents, cleaning solutions, mould and algae or any other contaminants that may affect adhesion. Painted or glossy surfaces must be specially treated prior to the application of any plaster material. All cracks that may be the subject to ongoing movement must be correctly repaired and reinforced. Tilt slab and other precast concrete items should be chemically cleaned with a water blaster and left to dry to ensure any mould release agents are removed before the Tankit is applied. Failing to correctly prepare the substrate, may affect the adhesion of the Tankit and hence the subsequent ability of the Tankit to provide a waterproof barrier.